Potential contributors to Babylon.js can come from many different backgrounds. 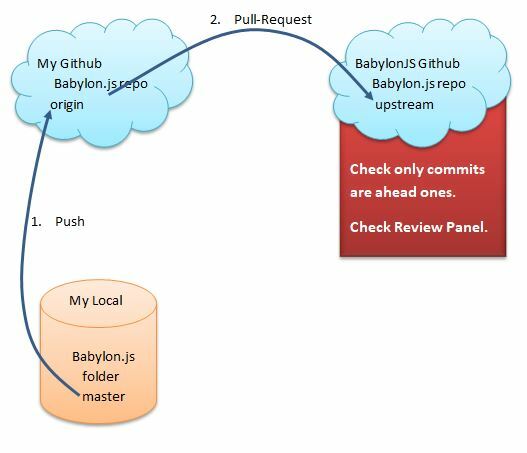 For some of you version controllers, repositories, package managers and task runners are second nature and all you need to know are the requirements set by the Babylon.js core team for a pull-request to be accepted. For other of us, perhaps just wanting to explore the world of 3D, they can start out as a series of confusing hurdles. So this page will contain details that many of you can ignore as obvious. For others those details may be the difference between making a contribution or not. Hopefully all the steps are included that will enable all those with the appropriate coding skills to contribute. NOTE: If you're looking to contribute to the Documentation, please use this guide. 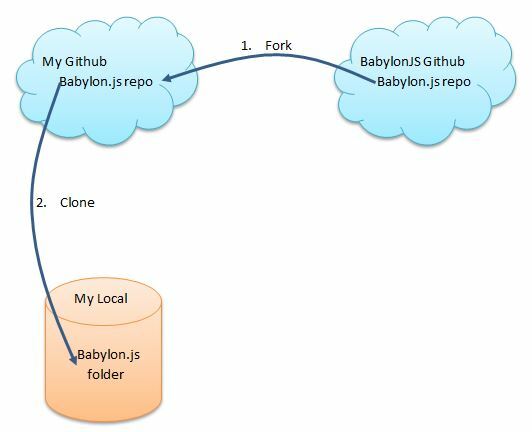 Babylon.js is maintained on Github, a web-based hosting service for version control using Git. 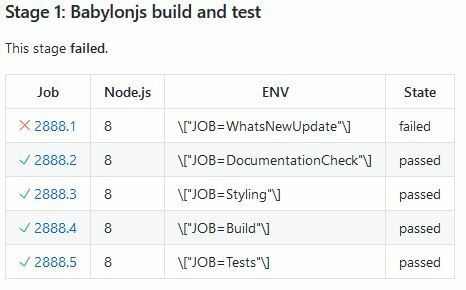 This page will introduce these and everything that is needed to make changes or additions to Babylon.js, from tools installation to testing, plus a brief description of why they are necessary. The steps are intended to be OS agnostic, allowing users to develop the same way on Windows, Mac and Linux. Know how to use a Command Line Interpreter (CLI). Used to issue Git commands. A quick way for Windows and Mac is from the Git Home Page and for all three operating systems from the Git Book. You then need configure the installation to your details using a CLI. You can use the CLI built into your computer or one of many specialist ones for Git (Git Clients). If you use Visual Studio Code then the Terminal is a built in CLI and can be opened with Ctrl + '. In order to run the Babylon.js tests you will need to have Firefox installed. Download it from the Firefox Home Page. 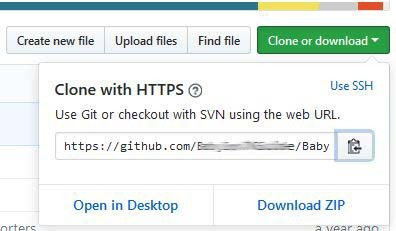 If you do not have one already open a Github account with your email address and still signed in go to the Babylon.js repository and fork with button at the top. If the CLI you are using accepts a paste then use the copy icon to the right of the address. This will save a lot of typing. The cloning may take some time. Now you have a local repository and a remote repository on Github. you can check all remotes are active. You can pull from upstream at any time provided any changes you have made are committed. Before embarking on editing or adding to Babylon.js please make sure you are familiar with the contribution guidelines. Visual Studio Code is a straight forward IDE with Git integration and is available for all three operating systems. It is worth a try though you may already have a favorite or recommended IDE. Once you are sure you have met the guidelines and have thoroughly tested all your changes you need to commit your changes. When in doubt about where your files should be referenced then raise an issue in the Babyon.js repository or ask on the forum. This can be done in Visual Studio Code using the source control icon on the left toolbar or with (Ctrl + Shift + G). After testing some files other than those you have added or edited will appear in the source control section of VSCode. For example changes to files in the dist folder. These should not be committed. Once you are ready to push to your repository these changes should be discarded. Only files you have actually changed or added should be in the commit. When using a Git Client you should also check that you are only committing those file you have added or edited and not those produced in any testing build. When using a CLI you need to add any files you have added or editing before committing them. So only add those files you have changed. The full path to the files from the current directory has to be used. git commit path to file/file1.ts path to file/file2.ts path to file/file3.ts -m "Description of Changes"
git commit file1.ts file2.ts file3.ts -m "Description of Changes"
An alternative way of ignoring the files changed during the testing build can also be found on this page. Node.js and npm can be installed from the Node.js home page. At the time of writing the version of Gulp needed was 4.0.0. The current What's New should indicate if there have been any changes of version. 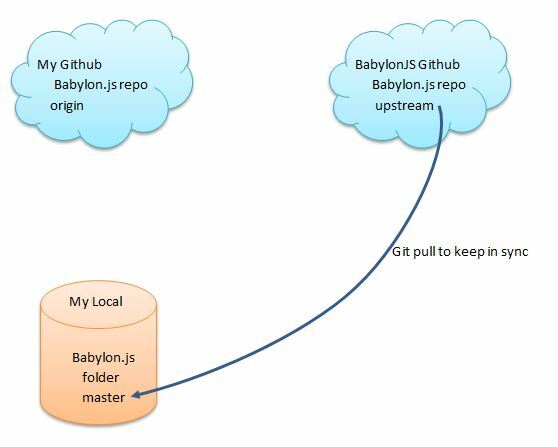 You can also look in the Babylon.js repository for package.json in Tools/Publisher which will give the version number for Gulp and Typescript. 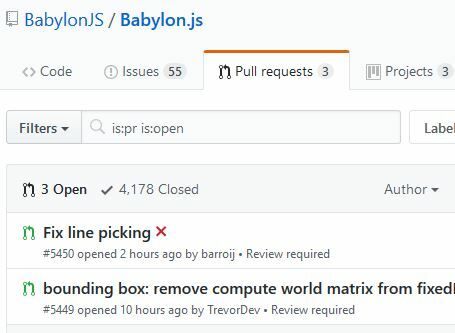 This only needs to be done once for a current version of Babylon.js, updates to npm or Gulp in later versions of Babylon.js may require you to update npm and Gulp on your local computer. After it is done any changes you make will be picked up automatically. Installing the npm applications in the directory takes quite a while and the Gulp build even longer so while Gulp is running is a good time to get a coffee or beverage of choice. Any error messages that fail the build should be corrected. The npm run build builds everything you need to test. git update-index --assume-unchanged "dist/preview release/babylon.d.ts"
git update-index --assume-unchanged "dist/preview release/babylon.js"
git update-index --assume-unchanged "dist/preview release/babylon.max.js"
git update-index --assume-unchanged "dist/preview release/customConfigurations/minimalGLTFViewer/babylon.d.ts"
git update-index --assume-unchanged "dist/preview release/customConfigurations/minimalGLTFViewer/babylon.js"
git update-index --assume-unchanged "dist/preview release/customConfigurations/minimalGLTFViewer/babylon.max.js"
git update-index --assume-unchanged "dist/preview release/loaders/babylon.glTF2FileLoader.js"
git update-index --assume-unchanged "dist/preview release/loaders/babylon.glTF2FileLoader.min.js"
git update-index --assume-unchanged "dist/preview release/loaders/babylon.glTFFileLoader.js"
git update-index --assume-unchanged "dist/preview release/loaders/babylon.glTFFileLoader.min.js"
git update-index --assume-unchanged "dist/preview release/loaders/babylonjs.loaders.js"
git update-index --assume-unchanged "dist/preview release/loaders/babylonjs.loaders.min.js"
git update-index --assume-unchanged "dist/preview release/typedocValidationBaseline.json"
git update-index --assume-unchanged "dist/preview release/viewer/babylon.viewer.js"
git update-index --assume-unchanged "dist/preview release/viewer/babylon.viewer.max.js"
Should you be using VSCode then you can open the Command Palette either from the View menu or with (Ctrl + Shift + P) then begin to type run this takes you to the Tasks:run options, choose Tasks:run and type run in the box that opens up. Alternatively press (Ctrl + ') to open the terminal which is a CLI. When using VSCode you can also kill the task by opening the the Command Palette either from the View menu or with (Ctrl + Shift + P) begin to type terminate and choose the Tasks: Terminate Task option. Also using VSCode there is a Debug tab on the menu. To use it with Babylon.js you need to install the chrome debugger extension, find out more from Debugger for Chrome. All of those allow debugging the source code of bjs directly from typescript. If you wish to test the fully compiled version instead of independent files simply append ?dist=true in the different urls. You could also test against the minified version by choosing ?dist=min. this will work on all the referenced URLs. Hint: You may need to refresh the code before adding back a new breakpoint. A quick way to test if your code works is to open the local playground and write code that calls on the classes you have created. It is also possible by creating an index.js file in the /localDev/src/ folder and copying and pasting playground code into this index.js file. The entire /localDev/src folder is git ignored and is meant to be your local test folder. From there you can easily add a breakpoint in your playground code or the Typescipt files for debugging. Adding in the url ?dist=true or ?dist=min will help testing against the built files. As using only one test file is annoying, feel free to number the files index.1.js, index.2.js... and so on. In VSCode, copy pasting the file in the same folder results in creating the next available slot in the folder e.g. copy pasting index.1.js will create index.2.js. This should help playing and debugging locally. As part of your testing process, it is highly recommended to launch the build validator: http://localhost:1338/tests/validation/index.html. It will run several scenes against a reference image to detect any visual changes. A reminder to read the contribution guidelines. If all your commits are ahead of the upstream Babylon.js:master you can issue a pull request using the button shown below and follow the steps. and then push into your repository again. Once your pull-request has been issued then it needs to be checked, reviewed, approved and merged. Find your pull-request from the list and open it. Should there be any then a red cross indicates the area of failure. Click on details for more information. In the above image you can see that this pull-request failed in WhatsNewUpdate. Probably because no entry was made in dist/preview release/what's new.md. It has passed the DocumentationCheck since all the comments have been entered as describe in the formatting of comments for the API. For any failures re-edit your local files, commit and push to your repository. The alterations will automatically added to your pull-request and it will be re-checked. Once your pull-request has been merged it will become live once any changes have been deployed into the Preview Release usually overnight but sometimes delayed a couple of days. gulp run launches all the watchers and a web server. gulp webserver launches the webserver only. gulp watch launches the watchers only. gulp typescript generates the BJS distribution files. gulp typescript-libraries generates all the library (materials, procedural textures...) files in the dist/preview release folder. gulp loaders generates all the loaders files in the dist/preview release folder. gulp serializers generates all the serializers files in the dist/preview release folder. gulp materialsLibrary generates all the materials files in the dist/preview release folder. gulp proceduralTexturesLibrary generates all the procedural textures files in the dist/preview release folder. gulp postProcessesLibrary generates all the post processes files in the dist/preview release folder. gulp inspector generates the inspector files in the dist/preview release folder. Update /dist/preview release/what's new.md file.